Kalakaua Avenue, Waikiki’s main thoroughfare and one of the world’s greatest avenues, is where all the attraction and excitement can be found! It is a world-class pedestrian environment with publicly accessible gathering spaces adjacent to wide sidewalks with complementing landscaping and décor. Find upscale fashion boutiques, one-of-a-kind shops, national retailers, fine dining, quaint noodle shops and access to Waikiki Beach. Kuhio Beach is a section in Waikiki Beach stretching from the Moana Surfrider Hotel to Kapahulu Avenue. It is a well-liked beach for families since it provides a sheltered swimming area created by an offshore retaining wall. Kuhio Beach Hula Mound is located adjacent to the beach, near the Duke Kahanamoku statue, on Kalakaua Avenue (at Uluniu Avenue). It is a casual, grassy, outdoor stage situated under a majestic banyan tree and is the location for many hula concerts. Audiences sit on the grass, so bring your beach chairs and mats. 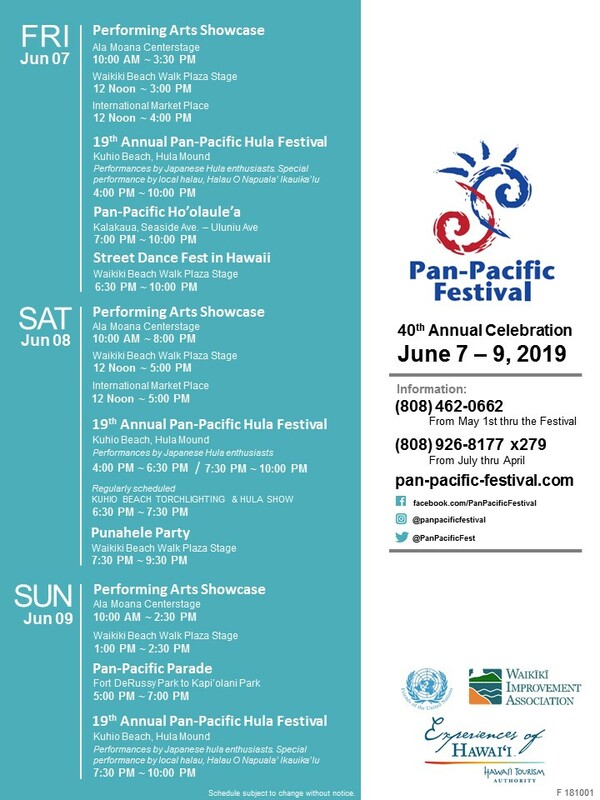 Enjoy hula performances at the Pan-Pacific Hula Festival and watch the sun set on world-famous Waikiki Beach! Waikiki Beach Walk, to date, the largest development in Waikiki’s history, has become the gathering place of modern Waikiki for visitors and residents to shop, dine, play and stay. Spanning nearly eight acres in the heart of Waikiki, this exciting entertainment district includes a vibrant showcase of more than 40 world-class retailers in an open-air, two-level center, an array of delicious restaurants and casual eateries, an outdoor entertainment plaza featuring live performances regularly, plus four accommodation choices. Waikiki Beach Walk is the consummate expression of Hawaii today – it is a place where people come to be enriched by warm hospitality, a colorful mix of cultures, and treasures from the land and sea. Ala Moana Center is a premier international and local shopping destination with over 290 shops and restaurants. From beachwear to high fashion, casual dining to fine dining, you’ll find everything at Ala Moana Center, all in a beautiful open-air setting filled with lush tropical landscaping and koi ponds. The Center’s Centerstage hosts over 500 performances a year by local groups as well as visiting national and international entertainers. Centerstage is located at Center Court, Street Level 1. The Performing Arts Showcase will be held at Centerstage on Friday, Saturday, and Sunday. The International Market Place features shopping in an open-air environment and opportunities to experience a unique “Hawaiian Sense of Place” through the celebration of the history and culture of Waikiki and its people. Water features and Hawaiian landscaping, including an iconic banyan tree more than a century old, are featured throughout the center. Enjoy daily performances at the torch-lit stage in Queens Court. International Market Place features approximately 75 exceptional retailers, including Saks Fifth Avenue. The center provides a range of dining options as well. On the center’s third floor, is The Grand Lana’i, an amazing collection of seven signature restaurants offering indoor/outdoor dining and on the ground level is THE STREET, a Michael Mina Social House, a unique and exciting dining concept.